There’s no doubting the popularity of the BMW R 1200 GS and R 1200 GS Adventure. The touring enduro models continue to led all other models in the BMW Motorrad lineup, helping the Bavarian brand continue to grow sales year-over-year through 2017. To further capitalize on the GS’ popularity, BMW Motorrad offers a huge selection of aftermarket accessories. 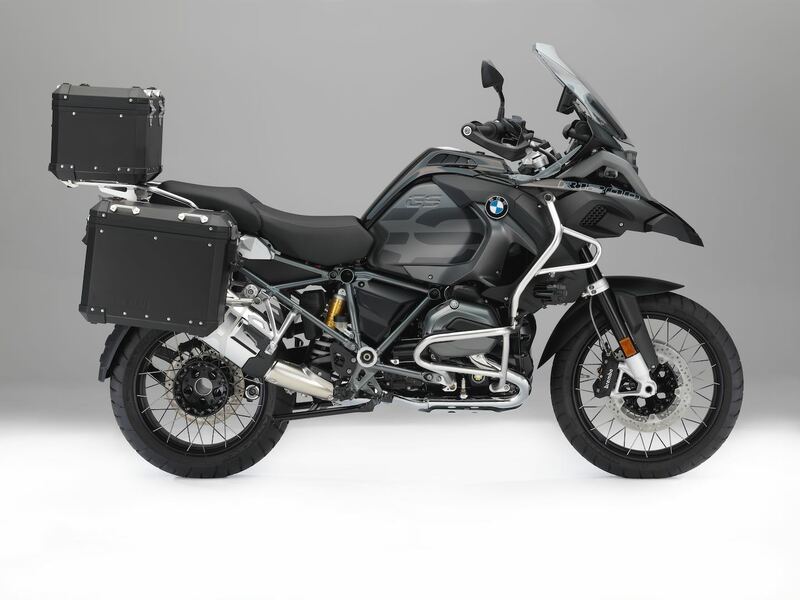 The latest is a specially matched lineup of “Edition Black” Original BMW Motorrad Accessories, which includes everything from aluminum luggage to radiator covers. The aluminum luggage system consists of two side cases (36 l + 44 l) and one topcase (32 l) and is a practical solution for stowing luggage away safely. Each of the black anodized cases has two locks, and they are also fitted with lashing eyes for securing extra luggage. Additional accessories include inside bags for cases and topcase, a backrest pad for the topcase, and carry handles. A single-key locking system is also available. This sturdy luggage bridge in an attractive black design enables safe securing of luggage. It is made of durable, rustproof stainless steel with black powder coating. It is also suitable for use with the Atacama soft luggage system. This case holder is made of rustproof, powder-coated stainless steel and allows safe securing of Atacama side bags, even under off-road conditions. It is also suitable for use with aluminum cases. This robust aluminum enduro engine protector is made of 2 mm thick sheet aluminum and is specially designed for use in off-road terrain. Significantly longer and wider than the standard engine protector, it guards effectively against impacts from rocks and stones, thus protecting the bottom section of the engine against damage. It has a black anodized finish and its holder is made of durable stainless steel. The gear shift lever is made of black anodized aluminum and is designed specifically for riding while standing in the footpegs. For this purpose, it is fitted with a kick unit that can be adjusted by means of a slot hole. By varying the distance between the kick unit and the footpeg in this way, it is possible to make adjustments for shoe size, and it also improves control when riding in a standing position. This case holder is used for attaching vario cases and pillion footpegs to the motorcycle. Thanks to its matte-black anodized surface, its finish perfectly matches that of the vehicle. The shape and dimensions of this footpeg mount correspond with those of the series model; it permits the attachment of pillion footpegs to the motorcycle, has an integrated heel guard and is matte-black anodized. These radiator covers are made of black powder coated solid stainless steel; they are attached to the trim and round off the design in a particularly athletic and masculine fashion. “Style” radiator covers, black correspond with the serial parts of the Style models Rallye and Exclusive. For this reason, these parts only fit the corresponding models. These spring-loaded, black anodized rider footpegs offer maximum comfort when sitting. When riding in a standing position, particularly in off-road terrain, the kick plate compresses and uncovers a jagged external contour for additional hold and enhanced vehicle control. Moreover, the setting screw allows the height to be adjusted over three positions. These high-quality, forged-metal rider footpegs also feature a replaceable plastic wear protector and lasered a BMW Motorrad lettering. For more, visit BMW Motorrad Original Accessories. Previous article2018 Monster Energy Supercross Predictions Revisited: How Did I Do?